You will find on this page links to tools related to the study of the Hebrew Scriptures/ Old Testament. SHEBANQ stands for System for HEBrew Text: ANnotations for Queries and Markup and is an incredibly sophisticated open-access system for the study of the Hebrew Bible, produced by the ETCBC in cooperation with the German Bible Society and the Netherlands Bible Society. SHEBANQ offers a very powerful tool for the study of the Hebrew Bible (I have only just discovered it and so have only explored a small part of what it has to offer). It has been designed as a space for Hebrew textual scholars to share knowledge, research and questions about the text by adding comments and queries in a sort of online, dynamic and organic critical apparatus. However, it also finds a very useful resource for students and other interested people. The text can be selected in Hebrew and phonetic Hebrew forms – both formats are fully marked and tagged. Clicking on words accesses colour coded information (colours can be selected and changed to suit the user’s wishes). SHEBANQ also offers a very useful tool for those learning Hebrew through its Bible Online Learner package (this also includes Greek). For those who want to set up an account, there are quizzes and exercises to complete. However, there is also the facility to type in the reference to any Hebrew text and the text is fully broken down (and annotated) according to word, phrase, clause and sentence. 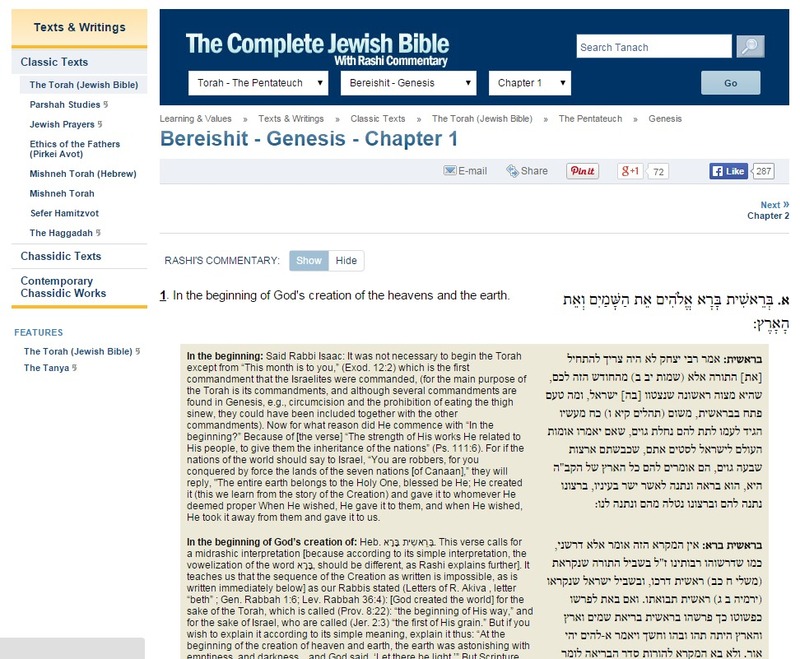 This site provides a searchable complete Hebrew Tanach (Jewish Bible), with Hebrew and English translations and which is accompanied with a Rashi commentary. The text is ordered according to the Tanach. The three sections (Torah, Nevi’im and K’tuvim) can be selected as well as their respective individual texts. The commentary is from Rabbi Shlomo Yitzchaki also known (in Latinized form) as Rabbi Solomon Isaac (1040 – 1105). Although old, it is still influential and is a good introduction for those wanting to read ‘Old Testament’ texts from a Jewish perspective and encounter midrashic interpretation for the first time. Other useful texts can be found in the menu on the left of the screen. 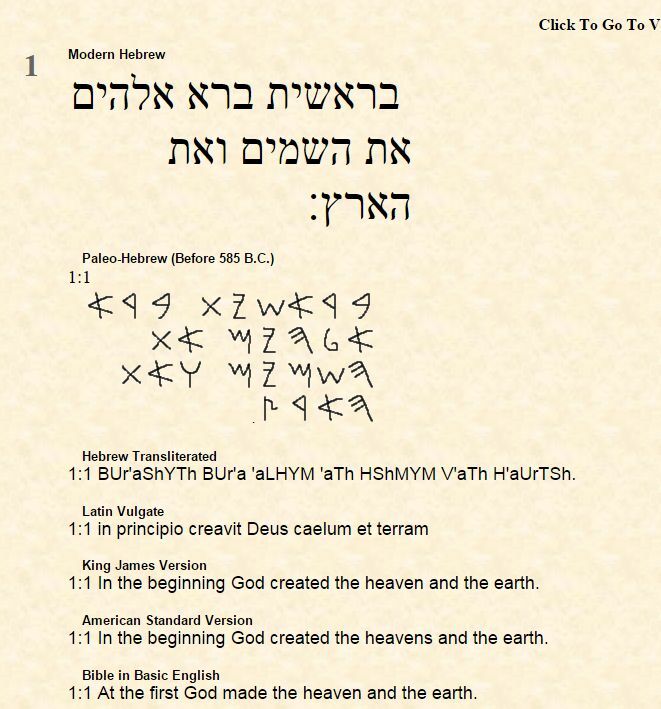 This site offers you parallel translations of the Old Testament that include three versions of Hebrew (Modern, paleo-Hebrew and transliterated), Latin (Vulgate) and eight other English translations per verse. It should be noted that there is no tagging and I am not not aware of which versions the Hebrew text reflect. Sefaria is a wonderful resource to which more material is being added. Sefaria in a virtual library of Jewish writings and is fast becoming the go-to site for these texts. Although many are in Hebrew, there is an ongoing project to provide English translations. Sefaria also provides a useful introductory video and tutorial.